Window blinds are often neglected by homeowners because they feel that it is not that important. Blinds however are very necessary in ones home. They come in many different styles including Venetians, which are available in aluminium, wood of various sorts and plastic, roller blinds normally made from cloth and available with either straight or scalloped bottoms. 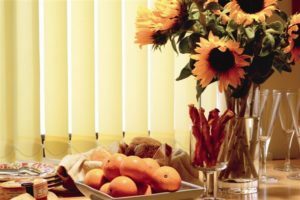 Roman blinds, Velux, woodweave, honeycombe and the favourite vertical blinds. be There are at least seven reasons why a vertical blind is a favourite choice among homeowners. The fabric choice is wide and includes stitch bond, jacquard, PVC, aluminium, and you can also get them machine washable. Different width of materials are also available. Keeping them clean is also easy, for as well as the machine washable ones others can be cleaned with a damp cloth. Control of vertical blinds is also a plus, the blinds can have controls on either side. Also the Louvre’s can be made to be pulled to one side, or alternatively be made to split in the middle and open like curtains. The louvre’s can be changed if or when the colour scheme is changed, at a fraction of the cost of buying a new blind. Headrails come in a variety of colours, including, white, brown and aluminium. Light control is excellent also with vertical, so whatever the mood or wanted privacy it’s just the pull of a cord (or even a remote control) to get the required ambiance.